President Benson is typically listed as being the “Secretary of Agriculture under Eisenhower” by the church, in order to lend his presidency credibility. While this is true, this doesn’t incorporate the full story of Benson. Benson was a member of the John Birch Society, which focused on surviving the Communist threat. Think “Red Dawn” (The Patrick Swayze version). “Those kids are like the Mujahidin Freedom Fighters led by Bin Laden” (Paraphrase of two lines from the movie). It was led by Robert Welch, Jr., a retired candy manufacturer from Belmont, Massachusetts. Welch named the new organization after John Birch, an American Baptist missionary and United States military intelligence officer who had been shot by communist forces in China in August 1945. “Could Eisenhower really be simply a smart politician, entirely without principles and hungry for glory, who is only the tool of the Communists? The answer is yes.” He went on. “With regard to … Eisenhower, it is difficult to avoid raising the question of deliberate treason” (Quoted at “Glenn Beck talks with JBS President John F. McManus” Aug. 15, 2006). Interestingly enough, after this was published, Benson tried to turn Eisenhower in to Hoover as a communist. Then, Benson tried to get Hoover a spot to speak at General Conference. This is likely during the period where J. Edgar Hoover was having an affair with a senior staff at the FBI, although Hoover’s sexuality is still being debated by scholars. Regardless, this puts Ezra Taft Benson clearly in control of Welch’s mindset because, before this, Benson had asked permission from the First Presidency to serve as an ambassador, showing that he respected Eisenhower and the Prophet. Last evening, October, 1957, Elder Ezra Taft Benson called me by telephone at my home and asked whether or not he should accept a government appointment to go to Rome, Italy. The American Ambassador to Italy there would like to arrange a conference for him with the Pope. I told Brother Benson that I would talk with my counselors this morning and then let him know” (David O. McKay Diaries, Wednesday, October 2, 1957). In March, 1961, the John Birch society begins opposing fluoridation programs. Water fluoridation clearly is helpful in fighting cavities, but even in 2005, places like Tooele, Utah still fight fluoridation in large part because of these teachings. Also, Ezra T. Benson quoted a John Birch Society book, “None Dare Call it Conspiracy” and promoted it during General Conference. 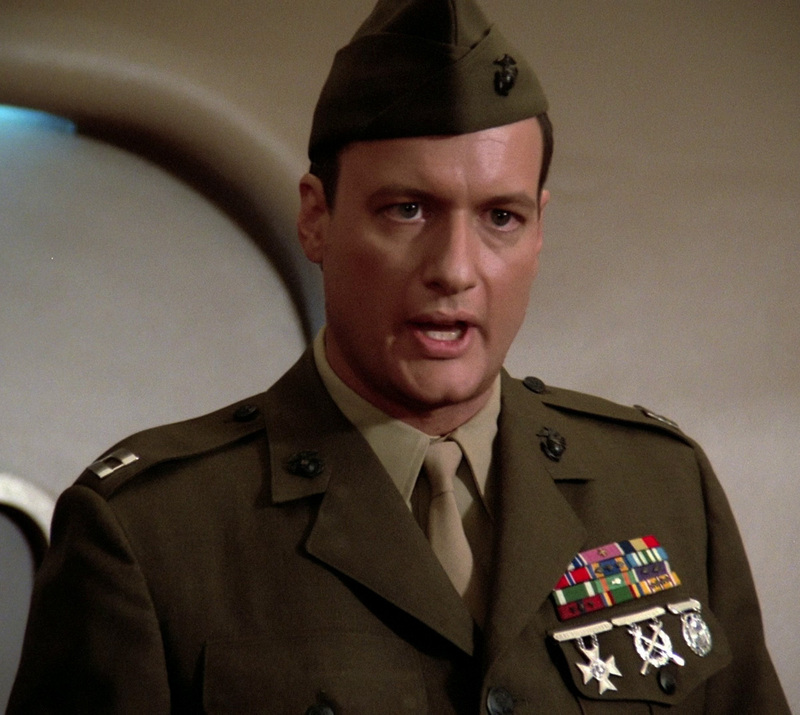 Suddenly, the idea of stopping the commies, so prevalent in the 80s, was silly– as ridiculous as the “forsooth” language Q was using a few seconds before in the episode. All of the rhetoric was just bizarre old men fear mongering. It was as silly as the movie Red Dawn appears today (no, I haven’t seen the remake). It’s as bizarre as seeing Osama Bin Laden’s Mujahidin in the Oval Office with Ronald Reagan. 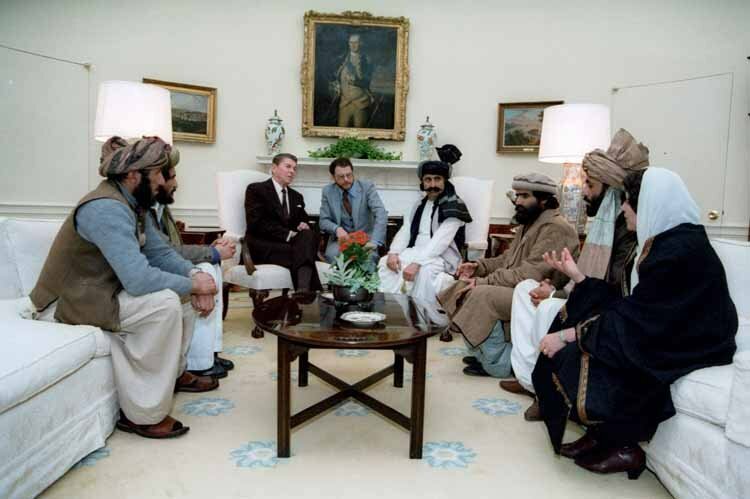 Yup, that’s Reagan meeting with Osama’s men because he dedicated the Space Shuttle “Columbia” to them.